Although it lasted only a single term, the presidency of George H. W. Bush was an unusually eventful one, encompassing the fall of the Berlin Wall and the reunification of Germany, the dissolution of the Soviet Union, the invasion of Panama, the Persian Gulf War, and contentious confirmation hearings over Clarence Thomas and John Tower. Bush has said that to understand the history of his presidency, while "the documentary record is vital," interviews with members of his administration "add the human side that those papers can never capture. 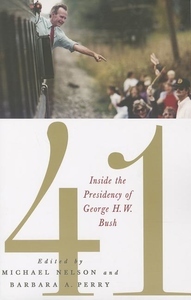 "This book draws on interviews with senior White House and Cabinet officials conducted under the auspices of the Bush Oral History Project (a cooperative effort of the University of Virginia's Miller Center and the George Bush Presidential Library Foundation) to provide a multidimensional portrait of the first President Bush and his administration. Typically, interviews explored officials' memories of their service with President Bush and their careers prior to joining the administration. Interviewees also offered political and leadership lessons they had gleaned as eyewitnesses to and shapers of history.The contributors to 41--all seasoned observers of American politics, foreign policy, and government institutions--examine how George H. W. Bush organized and staffed his administration, operated on the international stage, followed his own brand of Republican conservatism, handled legislative affairs, and made judicial appointments. A scrupulously objective analysis of oral history, primary documents, and previous studies, 41 deepens the historical record of the forty-first president and offers fresh insights into the rise of the "new world order" and its challenges.Contributors: Henry J. Abraham, University of Virginia; Jeffrey A. Engel, Southern Methodist University; Hugh Heclo, George Mason University; Sidney M. Milkis, University of Virginia; Michael Nelson, Rhodes College and University of Virginia; Barbara A. Perry, University of Virginia; Russell L. Riley, University of Virginia; Barbara Sinclair, University of California, Los Angeles; Bartholomew Sparrow, University of Texas at Austin; Robert A. Strong, Washington and Lee University; Philip Zelikow, University of Virginia.